VESA Compatibility: 50x50, 75x75, 100x100, 200x200, 300x200 - for 15-42" TVs. Quick and easy to install - bracket comes complete with full instructions and fitting hardware. Ultra low profile: measures just 27mm from the wall. Max Weight capacity: 40KG. Please ensure that your television meets the VESA requirements of this mount (300x200 Max). If your television does not meet this requirement it won't be compatible. I don't know if this is the best wall bracket I've ever seen, but it's definitely up there. I don't know if this is the best wall bracket I've ever seen, but it's …I don't know if this is the best wall bracket I've ever seen, but it's definitely up there. Hang on in there the best is yet to come! My expensive TV is on the wall with the bracket from the same company ( domu-uk ). They make some of the best TV brackets. Check here. 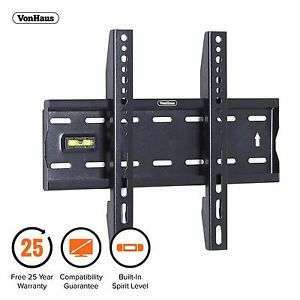 vonhaus brackets are pretty good to be honest, I've used them for years mounting large monitors and tv screens at work etc. Just ensure the wall fixings are into wood whenever you can and the mount itself won't let you down - only your mounting skills with the base plate. I’ve got two of these brackets holding TVs up here and they are very good. Quality is fine and I’d be happy hanging a £4K tv on them. vonhaus brackets are pretty good to be honest, I've used them for years …vonhaus brackets are pretty good to be honest, I've used them for years mounting large monitors and tv screens at work etc.Just ensure the wall fixings are into wood whenever you can and the mount itself won't let you down - only your mounting skills with the base plate. I’ve got two of these brackets holding TVs up here and they are very good. …I’ve got two of these brackets holding TVs up here and they are very good. Quality is fine and I’d be happy hanging a £4K tv on them. I've got a Vonhaus dual monitor arm and it's really solid compared to other branded ones (they're all from china, but somehow VonHaus performs great). Got one of these from Amazon for £7.50 delivered last week and thought I'd done well! Heat!